"I saw Happy The Man, and I was blown away by them. They were in the catbird seat—the best of that style band that anybody had ever seen before. There were a bunch of brilliant people in the same band, and they were on the cutting edge of something brand new. They were the deal. Listen to "Steaming Pipes" and tell me it’s not brilliant." 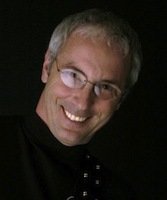 In September of 1976, after "Happy the Man" was signed to Arista, I learned about Paul Reed Smith through the guys in the band Artful Dodger - who lived near us in Reston, Virginia. One of their guitar players had a very early PRS and he raved about it. Paul had designed and built his own guitar in shop class in high school and by this time he was gathering an impressive array of stars playing his instruments. He was driven by the concept that there should be one guitar which could employ all of the best features and characteristics of the Gibson's and Fender's of the day. At that time, he had only made a handful of instruments, but Ted Nugent, Peter Frampton and Al DiMeola were already on board, and he had Carlos Santana and a laundry list of world-class players waiting in the wings. There seems to be several versions of the this story floating around, but here is my version and recollection. My guitarist Stan Whitaker was with me and we were playing a show that night in Annapolis. This was a couple of months after learning about Paul from Artful Dodger. We were killing time before sound check and we more or less stumbled by chance into Paul's tiny 33 West Street shop. We remembered that this was the guy that the folks in Artful Dodger were raving about. 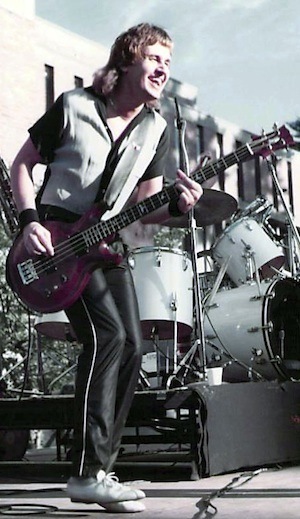 We went upstairs and introduced ourselves, and I got to play a beautiful black frestless bass he had just finished for Stanley Sheldon, who was Peter Frampton's bass player. I fell in love with the overall look and feel of the Sheldon bass. Paul showed up at our gig later and invited us back over to the shop the next morning, before we headed back to Reston. We spent some more time at his shop, and Stan decided he wanted Paul to build him a double neck guitar and I wanted a custom bass. Over the course of the next week or so, I had several in-depth discussions with Paul, and after we sorted out all of the details - Stan and I both decided to write Paul a check - in what would be among his very first "orders" for custom guitars. Neither of us realized at this point that there would become a medium scale standard at 32" - Paul was using his instincts and simply building a bass neck that was comfortable for him. At this point, I had become used to the Rickenbacker I owned - as much as you can become "used" to something that doesn't fit properly - and I wanted to incorporate some of the Rickenbacker features. I loved Paul's neck feel but I was used to the thin wide neck of the Rick. Paul borrowed my Rickenbacker and copied the neck, reducing it down to the 32.5" scale from the standard Rick size of 33.25" but keeping the thinness and width. He also agreed that the Rickenbacker treble pick up which added "crunch" should remain part of my sound. The bass he was making for me would become the seventh instrument he had ever built. 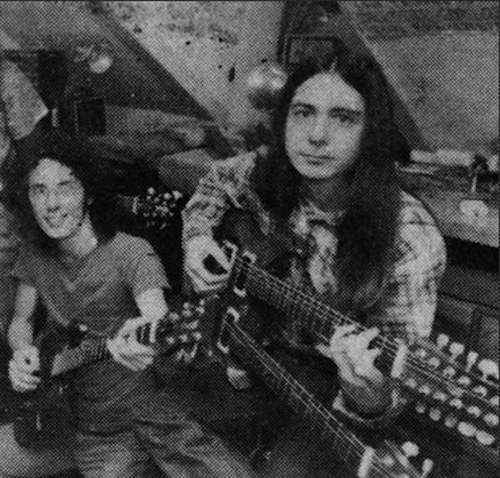 "The first shot above was taken at the 33 West Street shop, with Paul on the left and John on the right, strumming the custom PRS doubleneck they built for John. 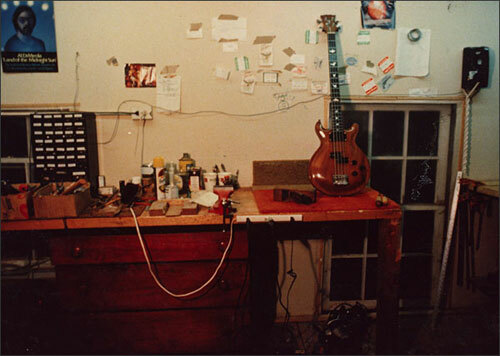 The next shot is an interesting early PRS bass with a (gulp) Fender split-coil P Bass pickup. 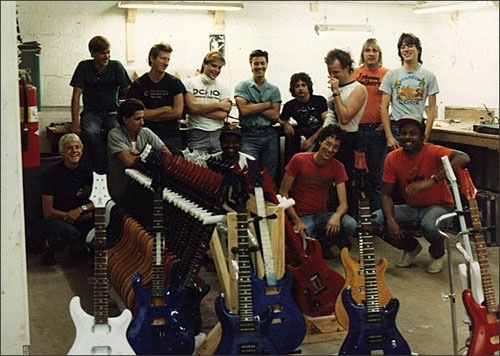 The shot at the bottom is the original PRS crew, in the days when the factory was starting up. Paul is in the center with the red shirt with John standing just behind him." 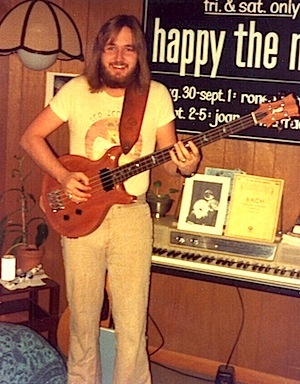 After waiting about a year for the bass, it arrived at A&M Studios in Hollywood at the tail end of recording the basic tracks for our first Arista recording, called simply "Happy the Man". When I opened the case, there were three business cards - two contained a note from Paul as below. "It was the total thing. I go on gut instinct, and something in my gut just said - they’re good - it would work well in the studio - and it did. It was very un-American, which I loved. Some of it was movie score-like which I enjoyed. I loved the strange time signatures; I worked with Mahavishnu Orchestra by this time, so I was into weird time signatures, which they had plenty of. It just grabbed me. I really loved their music. They worked well together." Although my parts had already been recorded with the Rickenbacker, producer Ken Scott (Jeff Beck, Stanley Clarke, Billy Cobham, Mahavishnu Orchestra, The Beatles) let me re-record "Knee Bitten Nymphs in Limbo" with the PRS and it was truly a revelation. 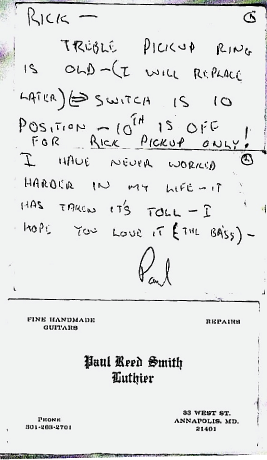 Paul had a nine position rotary switch - which provided nine different combinations of in and out of phase - on the Bartolini Hi-A "Beast" bass pickup. Ken christened it the"Dial-A-Brew" system - and I would continue to play as he would slowly twist the knob - effectively "dialing" and listening through the sounds - until he found the one he liked best for the song. Yeah, right - I am going to tell the guy who engineered many of my favorite albums how my bass should sound? I think not. Especially in 1977! 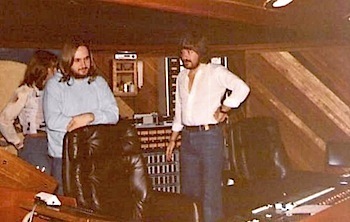 Here is a studio shot with assistant engineer Ed Thacker, me and Ken Scott. For the first time, I actually felt completely comfortable with an instrument. The scale length made all the difference in the world and gave my playing an edge I never had before. Parts I had been struggling with a bit on the Rick were so much easier to navigate on the PRS. The PRS for me was a dream and I could get around on it effortlessly. 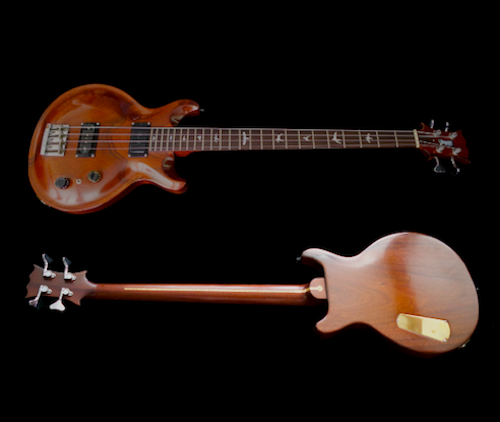 The bass featured an extremely light body and neck made of Honduras mahogany. A few months later PRS #7 developed some problems - and I had to give it back to Paul for repair. He had only built a couple of basses - and he was still experimenting with the design of his truss rods. He really went to an extreme to build the wide thin neck I had requested - and perhaps it was simply too thin. He had finished another bass in the meantime, the eleventh instrument he had built - which was pretty much a twin of my original PRS bass. He loaned me that one (serial number #11) to use while he fixed mine. I was heartbroken a couple of weeks later when he announced that the #7 bass was not fixable and that he would have to spend a year building me a new one. He couldn't even re-use the body due to the set neck. He then asked when he could get the PRS loaner back. He still had my Rickenbacker with no treble pickup - and PRS #11 was the only bass I had. I told him I had become used to the neck, which was shaped much more to Paul's liking - and that I wasn't giving it back. I told him I would take #11 "even up" as a swap for #7. He was upset, as he needed to sell the bass to make rent, but, I stuck to my guns and he eventually gave in. Later, I threw in the Rick which he managed to fix up and sell to one of my bass students for decent price, so it all worked out. The only difference between #7 and #11 was the neck shape. Also, the honduras mahogany was darker, heavier and very highly figured on #11. For the sake of comparison, you can see the differences in color of the two basses as below, #7 is on top and #11 is below it - being played a few years later in my rock band, "Vision". Number #11 is not only darker but much more on the red side than #7. After a time, we made up and Paul agreed to install the Rickenbacker treble pickup from #7 into #11 for me. He also came to several shows and decided he wanted to rewind the Rick pickup more to his liking. He did so, effectively boosting the mids at a different frequency, which added a warmth and smoothness to the sound. It also made it a one-of-a-kind pickup. 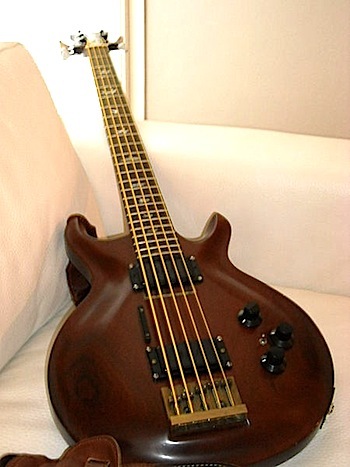 This was the only bass I owned and I used this bass exclusively from 1977 until 1999, when I realized - due to it's appraised value - I didn't want the PRS leaving the house. To my knowledge, this is the only Rickenbacker treble pickup that Paul ever rewound. 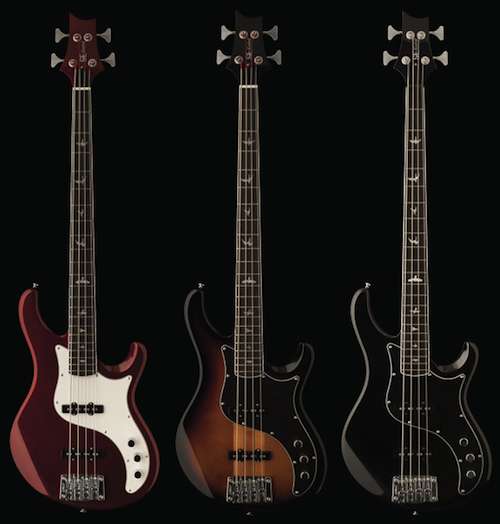 Even though Paul has abandoned his original medium scale concept, kudos to Paul for recently releasing the info on his first Far Eastern line of budget SE bass guitars, priced very competitively in the $700-$800 range. The offerings are pictured below, with the Kestral model on top and the Kingfisher model just below. Each model is available in the three colors as shown. Once again, Paul is making a serious run at the mid-priced bass market and we will see how it goes. We are definitely rooting for him. I personally think that Paul completely nailed it with the early design on #7 and #11. I love the smaller but thicker, heavier guitar body, it feels so perfect to me. 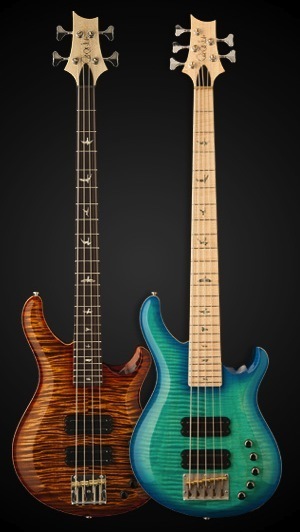 Below is a fairly new PRS Private Stock frestless bass. Interesting how everything old is suddenly new again as the latest bass is kind of a modern frestless version of PRS #11. Solid mahogany body, solid mahogany set neck. With all the trendy, exotic, gourmet woods floating around, Paul happily headed back to the basics and the pre-factory days with the simplicity of this bass. 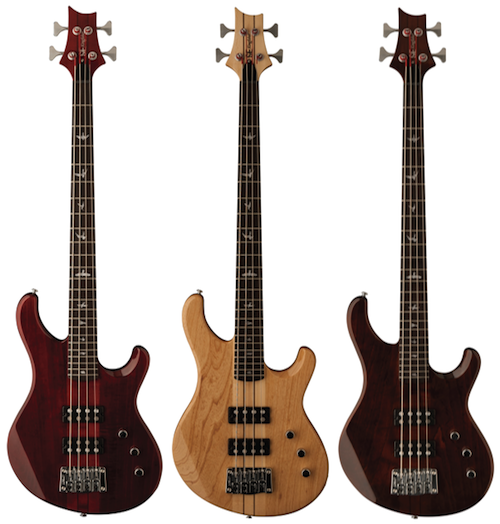 Other than the updated electronics, the heavier body carve, and the variation in the head stock shape, the two instruments appear to be twins - even though they were crafted nearly thirty-five years apart. If it ain' t broke, don't fix it, but I do wish this honey had a medium scale neck. 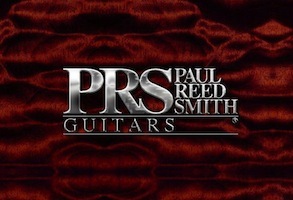 For more on PRS guitars click here. This heirloom bass is vintage pre-factory Paul Reed Smith – entirely handmade by Paul in his tiny second floor shop on West Street in Annapolis, Maryland in 1977-78. This bass is filled with subtle features which give a clear vision of all the PRS instruments to follow. This bass weighs in at 8.8 lbs and the width of the neck at the nut is 43mm. The set neck is angled back towards the player - more than a few degrees - in quite a different fashion than the standard Gibson and Fender offerings. If you look at the instrument from above, the neck angle emphasizes that the body is actually shaped like a wedge. This adds an element of playing comfort that you miss when you pick up any other bass. This rare instrument features a Honduras mahogany body and a set neck with a 32.5" scale - also in Honduras mahogany. There is a beautiful highly figured maple stripe on the back of the neck. The neck has a Brazilian rosewood fingerboard, with a unique natural binding, This old school process involves removing slivers of wood the length of each side of the fingerboard - mounting the frets and then gluing those pieces back in - so you can't see the "T" of the frets. The fret markers on the playing side are sterling silver dots and the patented PRS bird inlays are mother of pearl. The bridge is an original chrome Badass and the chrome original tuners are by Schaller. The electronics are also very unique. The bass pickup is a Bartolini Hi-A Beast with a nine position rotary switch. The circuitry features nine different combinations of in and out of phase. The treble pickup is a vintage Rickenbacker treble pickup, which has been rewound by Paul to his exacting specifications. There is a push-pull volume control which also turns the Hi-A Beast on and off. The toggle switch on the body turns the Rickenbacker pickup on and off. The body and neck are finished in satin and you would have to ask Paul what finish he used. I have a certificate of authenticity signed by Paul, and other than normal wear and tear of an instrument nearly 40 years old, there are no noticeable nicks, dings or scratches, and no belt buckle rash. No one except Paul has ever worked on this bass and even then it was for tune up and minor set-up tweaks when necessary over the years. 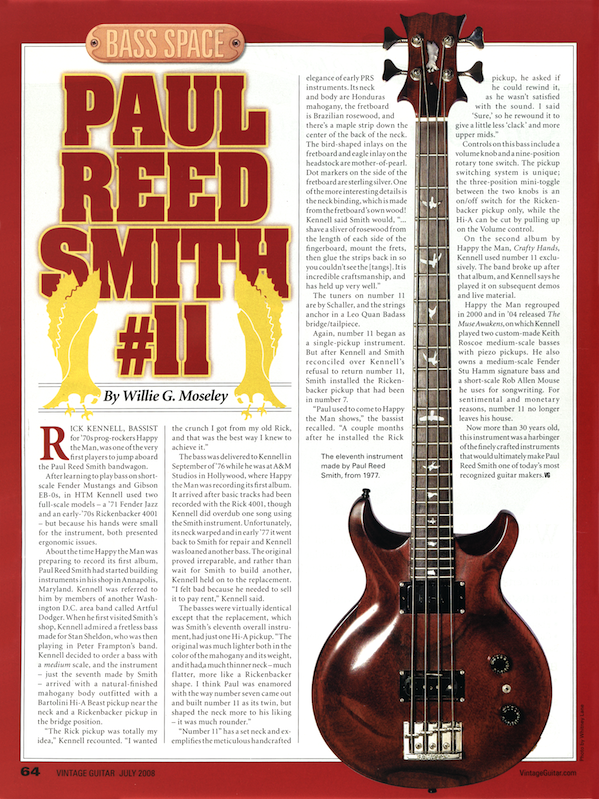 Special thanks go out to Willie G. Moseley for the article in "Vintage Guitar Magazine" about this bass - which is re-printed below. Paul Reed Smith makes guitars that are not only superior in functionality, playability and tone, but they are also incredible works of art. You can read the article by clicking on it below or clicking here, or you can read it on the Vintage Guitar site by clicking here.